Lama Zopa Rinpoche giving the oral transmission for Lama Tsongkhapa’s ”In Praise of Dependent Arising” at Nalanda, Bihar, India, February 2014. Photo by Ven. Roger Kunsang. 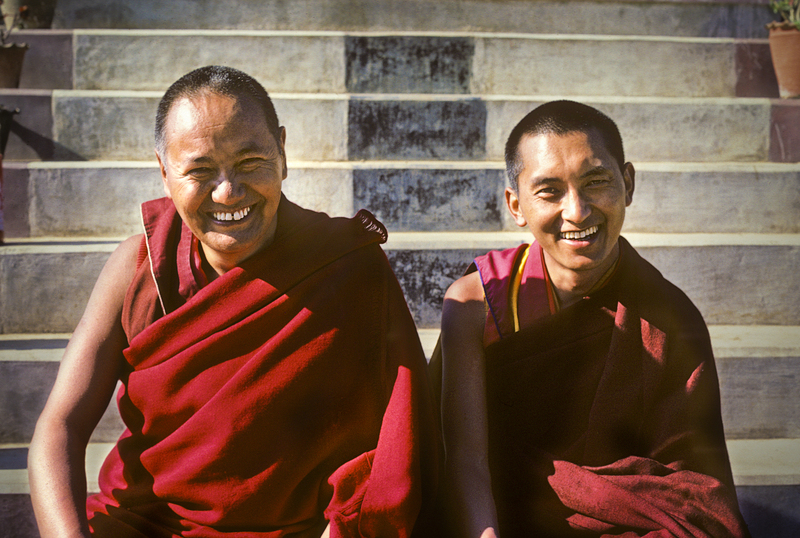 Lama Yeshe and Lama Zopa Rinpoche, Kopan Monastery, 1980. Photo by Robin Bath. Lama Zopa Rinpoche’s life accomplishments and contributions to the world thus far have served as an incredible testament to Rinpoche’s tremendous compassion for others. Lama Zopa Rinpoche brings benefit to every living being he encounters. Big or small. Rich or poor. Strong or weak. In 1970 Rinpoche founded, sponsored and built Kopan Monastery and Nunnery in Nepal. 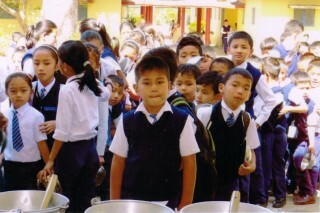 There are now approximately 400 monks and 400 nuns residing and studying there. In addition to starting Kopan Monastery and Nunnery, Lama Zopa Rinpoche has taken on the responsibility for sponsorship and development of Thubten Shedrup Ling Monastery, Eastern Nepal and in Tsum (the border region of Nepal and Tibet), Mu Monastery and Ranchen Nunnery. Rinpoche has established a number of free schools in India, and Mongolia, as well as a school offering western education (up to year 9) for the monks and nuns at Kopan Monastery and Nunnery. For example: Maitreya School, Bodhgaya has over 120 children, Tara Children’s Project in Bodhgaya is an orphanage for Indian children who are HIV positive, Children’s Development center in Mongolia, focuses on bringing Dharma education after school to children in Mongolia. In 1999, Lama Zopa Rinpoche sponsored the building of Idgaa Choizinling Monastery in Ulaanbaatar Mongolia. This is a Mongolian branch of Sera Je Monastery. Rinpoche also established the very first nunnery in Mongolia and continues to take tremendous effort to bring Dharma to Mongolia. President of Mongolia presents the “Order of the Polar Star” to Lama Zopa Rinpoche, Mongolia’s highest award for foreigners for distinguished service to Mongolia. In 2010 Lama Zopa Rinpoche received the prestigious Polar Star certificate from the Mongolian President in recognition of Rinpoche’s contribution in reestablishing the Dharma in Mongolia as well as for social projects. Rinpoche has an incredibly vast visions for FPMT, reaching far into the future, such as building 100,000 stupas and prayer wheels around the world so we can easily purify and create merit and in this way contribute to world peace. Rinpoche has already sponsored the creation of many holy objects around the world such as 11 large prayer wheels, 48 large stupas, 15 statues of Padmasambhava, as well as creating large thangkas for different centers around the world to display and make offerings to on special occasions, and writing the Prajnaparamita sutra in gold to be placed in heart of Maitreya Buddha statue in India. For Lama Zopa Rinpoche, all living beings are most precious. 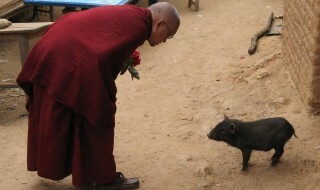 Causing no harm to any sentient being is a high priority of Lama Zopa Rinpoche and Rinpoche actively propagates vegetarianism in his Dharma talks, and also sponsors regular animal liberations and blessing, as well as sponsoring pujas during times when there are many animals killed (for instance on Thanksgiving and Darshain holidays). The Lama Zopa Rinpoche Bodhichitta Fund enables Rinpoche’s compassionate service to others to flourish. This fund sponsors a vast array of beneficial activities every year including the creation of holy objects around the world; sponsorship of young tulkus, high lamas and Sangha in India, Nepal, Tibet and the West; support to FPMT centers, projects and services; sponsorship of Dharma retreats and events; funding animal liberations and blessings; among many other priorities. This fund directly supports Rinpoche’s contributions to the preservation and flourishment of the Dharma around the world. Please return to Lama Zopa Rinpoche’s homepage for more information photos, videos, news and How to Contact. 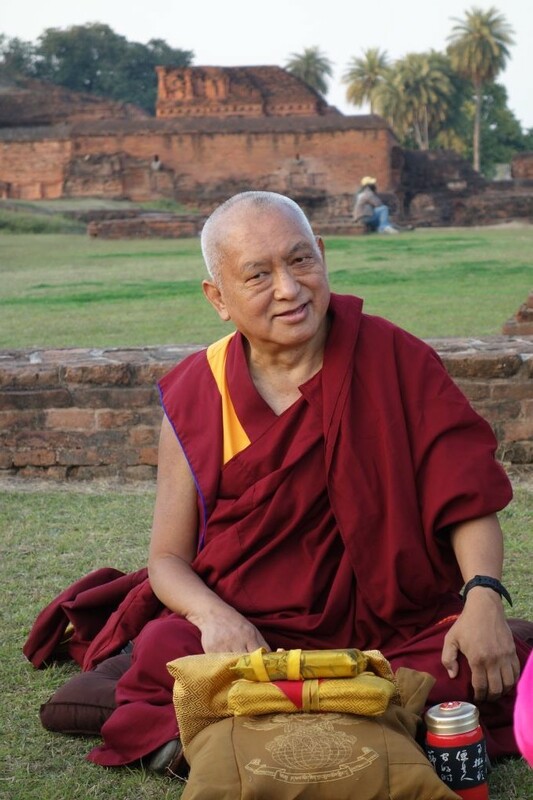 Lama Zopa Rinpoche is the spiritual director of the Foundation for the Preservation of the Mahayana Tradition (FPMT). Our organization is based on the Buddhist tradition of Lama Tsongkhapa of Tibet as taught to us by our founder, Lama Thubten Yeshe and spiritual director Lama Zopa Rinpoche.